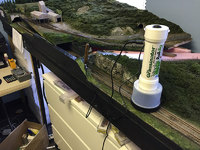 I saw an advertisement for "Grassinator" by Case Hobbies of Germany and I wonder what could be the advantage of using it in Z-scale ; if one considers the length of "blades of grass", they are VERY LONG if You convert to 1/1 : 0,5 mm (0.02", that is really short, can it even use such a length, and does it exist in stock ?) correspond to 110 mm (4.3") in 1/1 : for lawn surfaces this is all the way definitely too long ; it could just fit for meadows, and the double or triple of length too ... I think the real advantage would be for fields of corn or wheat, where heights of about 1 m (3.2', 4.5 mm = 0.18" in 1/220) are common. My local "model shop" lends such a device for a few days, and they think it's rather made for HO, even N scale being the limit. I saw that the minimum length sold by Noch is 1.5 mm, in Z scale this is about 1' in 1/1 ; they claim that the maximum lngth for Z (grass) would be 2.5 mm. I have considered the Grassinator several times over the years and haven't tried it for much the same reasons, so I'd also be interested in comments from users. Here's my thoughts for why I keep looking into it. Z scale rail is code 55 or larger. So rail height is 1' prototype. The grass isn't far from scale with respect to the rails. California, what I'm modelling, has tall grass, 1-2' prototype, so not atypical in scale. I've been told that one laid and dry, the grass can be "mowed" with a mustache and beard trimmer. It seems like a lot of work, particularly considering some of the new mat materials from Woodland Scenics. I wasn't going to bring up the Grassinator here as it's AZLs forum, but since it came up... as the Grassinator maker, I should probably chime in! Not surprisingly I do believe in applying static grass in Z with a powered static grass applicator, like the Grassinator. I tend to take close-up photos and often from ground level or at a slight angle, and this is where upright static grass really shines. Here are some test photos, one with a Z gondola with 6mm and 12mm grass. While the effect is less pronounced using 2mm grass, the effect of standing grass become much more apparent at 4mm and above. You can contact us about the Grassinator through our Ztrains FB page, we'd be happy to answer any other questions there! I think static grass looks great in Z scale because of how fine of a texture it has. 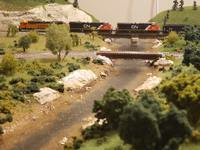 Sven’s pictures of his layout in the Chesapeake Bay tread are enough to convince me. The scenery that I’m looking to model is dominated by scrub brush, which I’m thinking that clumps of static grass will do well to depict. At least for Z, I think static grass might not be limited to being just plants that are technically grasses. Why not some general brush too? John- Might I ask what brand/color of grass you used in the picture? I love how those taller grasses look! I am a big fan of the Grassinator. I have had the opportunity to BETA multiple versions of John's work. The static grass really adds great texture to a layout. In our module restoration article that appeared in the May/June 2018 of Ztrack, we showcase the Grassinator and the application of static grass on the modules. You can see the static grass in the forefront of the module along the front edge. I love it also, you can do cut fields with 2mm or go wilder with 4-6 mm blends. Throw in some ground foam and I was very pleased with the results for a first timer. Your results can be limitless based on application and fiber selection. They make a good product. Plus with a metal pan, ie baking sheet and wax paper you can make your own tufts for pennies! I use Silflor very often in the 4-6mm range. I generally use their 'Late Summer' static grass as I find it has a nice muted color... same with Woodland Scenics Burnt Grass color. I think in this photo, Noch 12mm XL Spring Green was used for the taller stuff. I say I 'think', because during testing I bought so much of this, it's was a bit of a whirlwind! I generally start out nice and clean, and then start adding and mixing grasses as I go. Also I do often touch up the dried grass with an airbrush and thinned acrylic paint for very subtle color shifts. Funny you should mention Silflor late summer and Woodland Scenics burnt grass. Those are the two exact colors of grass that I picked out for myself! Also, I really like that airbrushing idea. I do find these very adaptable color grasses work well for many seasons, and they do take acrylic paint nicely. On additional color, even a $9 Harbor Freight airbrush can do the trick as you're just looking to lay down a fine-ish mist of color. Didn't have a chance to pick up a Grassinator yet... It's a must-have tool for scenery building in my opinion. Can't wait to start experimenting with one. 1 mm grass fibers are available from "Polak" (?). The minimum length is 1.5 mm for fibers by Noch, and it seems that the minimum by Woodland Scenics is 2 mm. When time comes to at last start my project layout I will need a Grassinator as well. To lay grass on....my tracks ! Which is not so strange as it initially sounds.